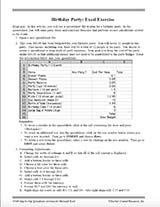 In this computer lesson, simple spreadsheet formulas are used to calculate shopping trip expenses. Students learn how to compute tax for each item and calculate the total cost of the purchases. This computer activity requires the Microsoft Excel® computer application.